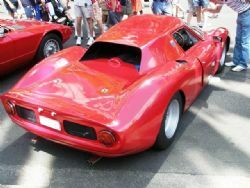 As Australia Day rolled around again I planned my annual pilgrimage to the NRMA Motorfest in the Sydney CBD. The weather girl suggested early morning showers with late afternoon thunderstorms so it was touch and go as I wasn’t going if it was wet and miserable. The morning was gloomy, dull and humid. It wasn’t wet. We went. Sydney really turns it on for the crowds on Australia day and apart from ferry and tall ship races on the harbour there are lots of other activities to do. 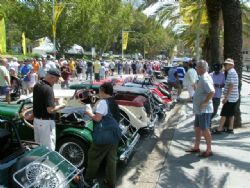 Top of my list is Motorfest, with over a thousand cars lining College and Macquarie streets and a few cross streets in between with just about every marque built in the last hundred years on display. This is an event dominated by car clubs with many of the clubs having a large chunk of their members come into town to show off their pride and joy. 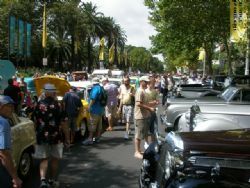 Big turnouts by the Morgan, FJ/FX Holden, Fiat, Hudson, Austin and many other clubs kept the onlookers enthralled. Many entrants have been doing this event for years and those in the know arrive very early to miss the ugly queues and then take off all over the city to enjoy Australia Day and the Festival of Sydney activities. This year was full on. The crowds, the cars, the weather – everything was in your face. There were throngs of spectators this year, a lot more than last year and the cafes, ice cream and drink vendors along Macquarie Street were doing a roaring trade. The NRMA tents were inundated with people getting insurance quotes, subscribing to their publications and getting a range of freebies on offer. All the vendors for the show would have been glad to see the end of the day as they were run off their feet. 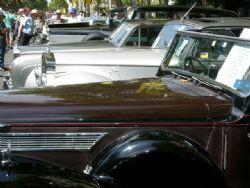 A superb range of classics, veteran and vintage vehicles were in attendance. Jowett Javelins to super rare Ferraris, Morris Minors to Huppmobiles. Old trucks, slope backed Pioneer buses, army, fire and other commercial vehicles were in attendance. Classic motorbikes, racing and speedway cars – it was all there and more. For some reason Motorfest does not attract many muscle cars or hot rods with only a handful of Monaros, Mustangs and a couple of rods on display. I thought I was going to pass out in the heat this year. The cloud burnt off, the sun came out and the humidity went through the roof. Any bit of shade was well patronised and the bars in Hyde Park had a license to print money. Thank god for the massive Moreton Bay fig trees that provided shade and cooler temps for the masses. Always good, this year was a little bigger and better. Next year if the weather girl says it is going to rain, I hope she is right and I will come in and enjoy it!